In the ancient Iranian myths, the Simurgh is a prophetic bird that nests on the Tree of Knowledge. The bird has huge wings, paws of a dog and fish scales. It dominates both in the sky, on land and in water. The legend of the Simurgh tells that a bird, flying over the mountains, drops its feather. The bright color of the feather was so addictive and eye catching that all the birds flew to that very place. Everyone wanted to get a priceless feather, and finally, they decided to find Simurgh to resolve the strife. Many of the birds were scared and refused to fly referring to this or that excuse. The parrot did not want to leave the cage, the nightingale did not want to part with the rose, the partridge could not leave the chicks and so on. In the end, they all agreed to find Simurgh. And they flew through seven seas and valleys, and the very last of them was “Destruction”. Many birds could not fly all the way and returned back. Thirty strongest and most resistant birds flew to the Mount of Simurgh. They had overcome suffering and reached spiritual enlightenment. 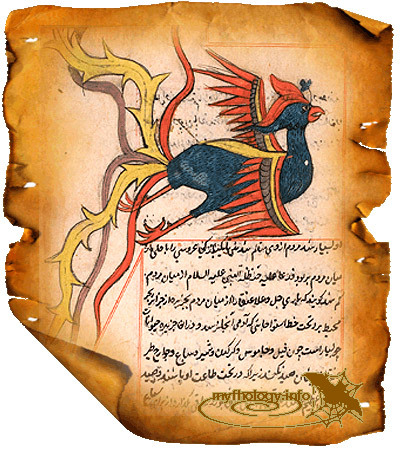 And when they reached the mountain, the truth was revealed to them – the powerful bird is hidden in each of them and they all together are Simurgh (the word “Simurg” si – thirty in the old Persian and the murg – bird).